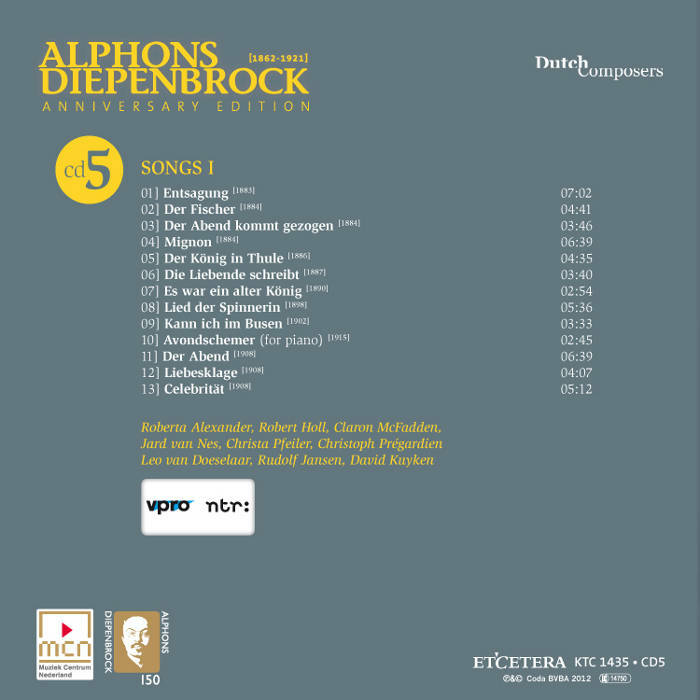 Diepenbrock’s earliest compositions include five songs on texts by Goethe. Two of them, the ballads Mignon and Der König in Thule (The King in Thule, RC 16) date from 1886. After a revision by the composer, they were published in 1889 and dedicated to the singing teacher Cateau Esser. The famous poem Mignon from Goethe’s novel Wilhelm Meisters Lehrjahre (Wilhelm Meister’s Apprenticeship) deals with the theme of ‘longing’ for Italy, embodied in the young girl who yearns for her fatherland. The poem’s hallmark is Mignon’s question which opens each of the three strophes. As a fledgling composer, it was a challenge for the 21-year-old Diepenbrock to tread in the footsteps of many masters. 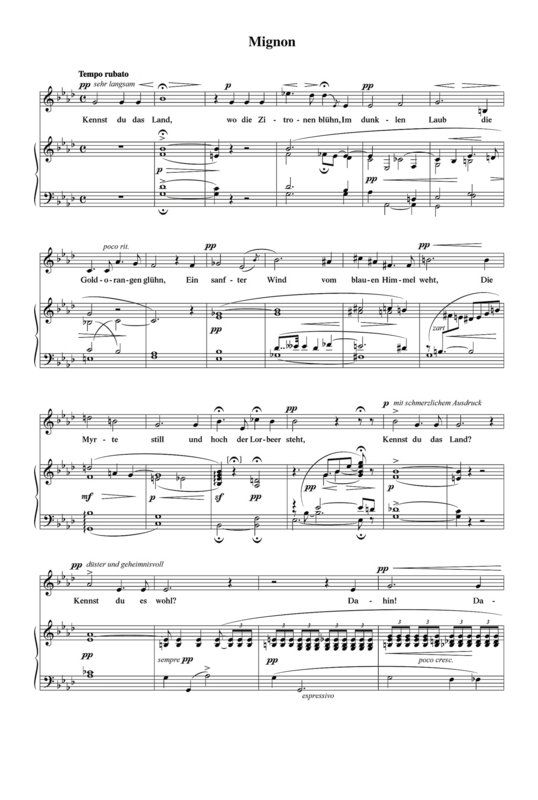 He was clearly fascinated by the character of Mignon, because two years later he also tried to set Goethe’s poem Mignon’s Verklärung (Mignon’s Transfiguration) to music (see RC 17*). Die Begleitung soll stets sehr zart ausgeführt werden. Der Vortrag naiv, einfach und den Worten Goethes gemäss: “Sie fing jeden Vers feierlich und prächtig an, als ob sie auf etwas Sonderbares aufmerksam machen, als ob sie etwas Wichtiges vortragen wollte. Das ‘kennst du es wohl?’ drückte sie geheimnisvoll und bedächtig aus, in dem: ‘dahin, dahin!’ lag eine unwiderstehliche Sehnsucht, und ihr: ‘Lass uns ziehn!’ wusste sie, bei jeder Wiederholung, dergestalt zu modifizieren, dass es bald bittend und dringend, bald treibend und vielversprechend war.” Wilhelm Meisters Lehrjahre, 3. Buch, 1. Cap. The voice sings the opening words “Kennst du das Land” (Do you know the land) without accompaniment. Characteristic of Diepenbrock’s flexible approach of the tempo are the indications tempo rubato, sehr langsam and the use of fermatas. The half-diminished seventh chord of the piano entry is reminiscent of Tristan and Isolde by Richard Wagner, a composer Diepenbrock greatly admired in his early years. The chord progression, which is repeated several times in Mignon, acts as a ‘question motive’. Mignon’s mood swings are mirrored by the direct succession of major and minor. The second strophe is more lively thanks to the leaps in the voice. Diepenbrock uses two consecutive ascending octave leaps to illustrate the word “Säulen” (columns).